Disney and Pixar’s Coco went into its third weekend in theaters in first place and emerged on the other side still at the top of the box office chart. The critically acclaimed Oscar front-runner brought in another $18 million domestically, upping its worldwide gross to $389 million. The PG-rated film from directors Lee Unkrich and Adrian Molina has been nominated for multiple Annie Awards as well as a Critics’ Choice award. The family-friendly movie took home best animated film honors from the National Board of Review, the New York Film Critics Circle, and the Hollywood Film Awards. Coco hasn’t had much in the way of competition, however that will change when Star Wars: The Last Jedi and Ferdinand open in theaters on December 15, 2017. Star Wars: The Last Jedi is expected to open in the $200 million neighborhood and is nowhere close to being the last time we’ll see the revived Star Wars film franchise launch a new entry in theaters. Solo: A Star Wars Story starring Alden Ehrenreich, Donald Glover, and Emilia Clarke will debut in theaters on May 25, 2018. Star Wars: Episode IX with Daisy Ridley, John Boyega, Oscar Isaac, and Mark Hamill is scheduled to premiere in December 2019. Rian Johnson, director of Star Wars: The Last Jedi, has been tapped to create a new Star Wars Trilogy. Johnson will write and direct the first of the three films which will feature characters “from a corner of the galaxy that Star Wars lore has never before explored,” according to Lucasfilm. 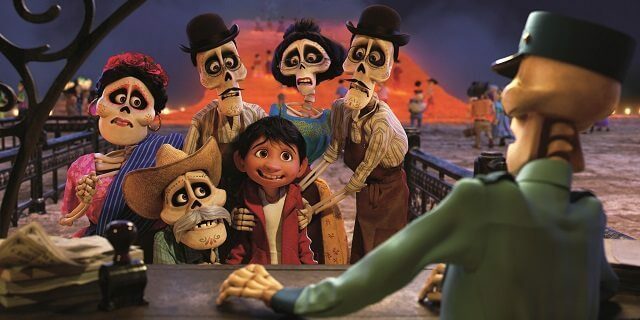 The Coco Plot: Despite his family’s baffling generations-old ban on music, Miguel (voice of newcomer Anthony Gonzalez) dreams of becoming an accomplished musician like his idol, Ernesto de la Cruz (voice of Benjamin Bratt). Desperate to prove his talent, Miguel finds himself in the stunning and colorful Land of the Dead following a mysterious chain of events. Along the way, he meets charming trickster Hector (voice of Gael García Bernal), and together, they set off on an extraordinary journey to unlock the real story behind Miguel’s family history.